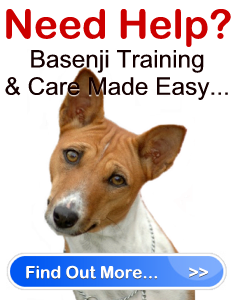 Basenji Dog Basics " "
One of the main reasons why some families dont have dogs is the incessant barking, most especially for those who live in apartment buildings. But not all dogs are noisy one such quiet breed is the Basenji. Although a Basenji dog can still whine, its tendency to bark is almost non-existent, making it a great breed for those that are looking for a quiet stay at home. But what is a Basenji dog? Surviving the time of ancient Egypt, it was first introduced in England in 1937, where it was developed and exported all throughout the world. When it came to Africa, it was used by the natives as guides, usually helping the natives with small game. It was only in 1941 did it arrive in the United States of America. A Basenji dog is characterized to be smooth, muscular, and athletic. With a wrinkled forehead, a short muzzle, and a short, shiny coat, it can come in different colors such as pure black, copper, red, and chestnut red, or it can come in tricolor, combining colors such as black, white, and tan. Weighing at around 20 to 26 pounds, and standing at a height of 15 to 17 inches, a Basenji dog is very compact but still has an elegant stance to it. Perfect for any family, a Basenji dog can fit in very easily as they are very affectionate, loves to play, and has a very strong desire to please its family. Despite this happy and cheery disposition, they are quite alert and intelligent making them easy to train. However, families, specifically children, must exemplify leadership or must be a good pack leader so as to keep it tamed. Resembling a cat, a Basenji dog likes to climb heights so climbing over chain fences might come natural to them; and just like a cat, it can also clean itself. Since it is able to lick itself clean just like cats, they require little to no grooming and it does not emit a dog smell from cleaning itself. Because of this grooming habit, it sheds little to no hair, making them great for people with allergies. If there was one thing that you should know about this breed is the fact that it likes to chew, so take care of your things and give it a lot of toys so as to avoid any problems. As for exercise, families who love taking long walks will work well with a Basenji dog since it requires long daily walks in order to release all of its mental and physical energy. If its owner is not consistent and does not take it out regularly on walks, the Basenji dog can end up lazy and stubborn. The Basenji dog can live a long life of 10 to 12 years. But sadly, it is prone to kidney problems that must be treated immediately when its symptoms do show up such as blood in its urine. It is also susceptible to other illnesses such as retinal atrophy, intestinal and eye problems. With little grooming needed and its attribute of not barking at all, families will certainly enjoy the company of a Basenji dog its just like having a cat, only its a dog.